An attacker drove a car over a curb and struck pedestrians, before attacking people with a knife on Monday morning. The suspect was shot and killed by police. 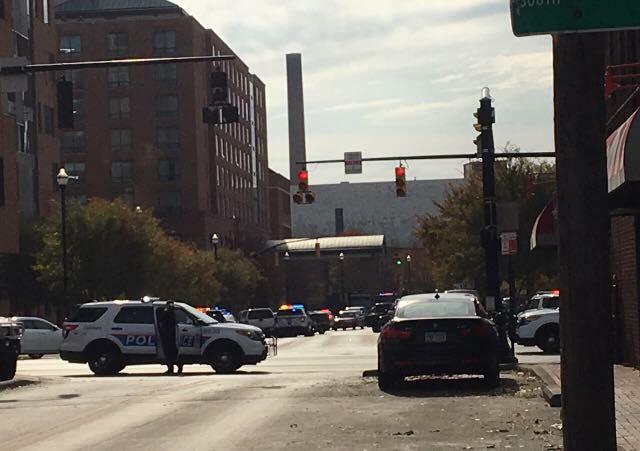 Police shut down the parking garage near Tuttle Park Place after an active shooter report was issued on Ohio State's campus. A man began attacking people with a butcher knife at Ohio State University after purposefully driving a car into a group of pedestrians on Monday morning, injuring 11. Within minutes of the attack, a campus police officer shot and killed the suspect. Our original blog post continues below. Eleven people - including a staff member, undergraduate and graduate students - were brought to local hospitals with non-life-threatening injuries. As of Tuesday afternoon, three remain hospitalized. A campus vigil has been announced for Tuesday at 7 p.m. at St. John Arena. The now-deceased suspect has been identified as Abdul Razak Ali Artan. A graduate of Columbus State Community College and a current Ohio State student majoring in Logistics Management, Artan was born in Somalia. Associated Press reported he had been living in the United States as a legal permanent resident after moving from Pakistan in 2014. He apparently wrote Facebook posts shortly before the attack, saying, "If you want us Muslims to stop carrying lone wolf attacks, then make peace" with ISIS. A motive for the attack has yet to be confirmed. The FBI and other agencies have joined an ongoing investigation into whether the attack was terrorism-related. Artan was not known to counterrorism authorities before Monday's attack. According to the AP, a "self-described Islamic State news agency called Artan 'a soldier of the Islamic State,'" although ISIS has previously called attackers its "soldiers" without having claimed to organize them. Columbus City Council called the attack an "isolated incident" and says blame should not fall on the Muslim and Somali communities, the Associated Press reports. The Lantern, OSU's student newspaper, profiled Artan in an August feature. In the interview, Artan identified himself as a Muslim and said he had transferred recently from Columbus State. "I wanted to pray in the open, but I was kind of scared with everything going on in the media," Artan said. "I'm a Muslim, it's not what the media portrays me to be." In a second press conference on Monday afternoon, OSU president Michael Drake answered a reporter's question about the potential for backlash after the incident. "We all know when things like this happens that there’s a tendency for people to put people together," Drake said. "What we want to do is unify together, support each other, do our best to support those who were injured in their recovery, and not come to conclusions." The attack left a number of people with stab wounds and injuries sustained from the vehicle. One person is suffering neurological injuries from the car attack, but is awake and is under observation. A second person suffered skeletal injuries. Wexner Medical Center treated six people, while three were taken to OhioHealth Grant Medical Center and two to Riverside Methodist Hospital. "This is obviously a tragic situation... and obviously something we prepare for every year with our students, our faculty, our staff," said Ohio State president Michael Drake at a press conference early Monday afternoon. "I just wanted to say that we are so grateful our police were on the scene, were able to neutralize the situation, and the injuries weren't severe." The responding officer was identified as Alan Horujko, 28. Ohio State Police Chief Craig Stone said Horujko was nearby because of a reported gas leak and was able to intervene quickly. In the second press conference at 4 p.m., Drake said that some of the victims had more work to be done but most were recovering and "in good spirits." Governor John Kasich also paid tribute to Ohio State students, faculty and staff, and urged patience with the investigation. "We're going to be extremely, extremely grateful that we're going to have a full recovery," he said. Ohio State Counseling and Consultation Services is offering counseling in four locations on campus. In addition, prayer vigils were planned on Monday at Jacob's Porch at 4 p.m., at St. Thomas More Newman Center at 5:30 p.m., and St. Stephen's Episcopal Church and University Center at 7 p.m. Though the incident was initially reported as a shooting, Columbus Police Chief Kim Jacobs said there is no evidence the attacker used a gun. No second suspect has been indicated. President-elect Donald Trump released a statement Monday afternoon on the incident, saying, "Our thoughts and prayers are with all of the students and administration." He added, "THANK YOU to all FIRST RESPONDERS who reacted immediately and eliminated the threat on campus." 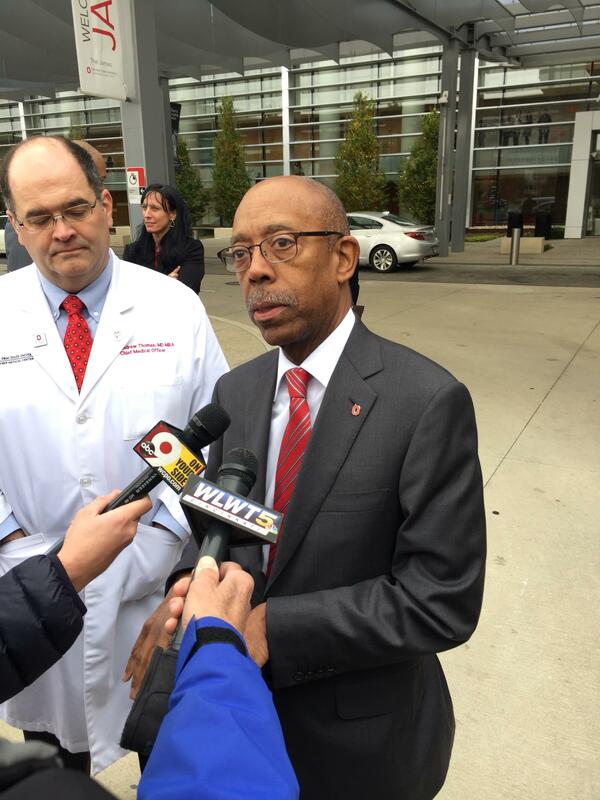 Ohio State University president Michael Drake talks to reporters outside Wexner Medical Center about the school attack on Monday afternoon. Facebook quickly released a Safety Check feature for the incident, allowing people in the area to mark themselves as unharmed. WOSU's Esther Honig reports that two suspects who had been arrested at the parking garage at Lane Avenue and Tuttle Park have been cleared. Though an all-clear was given by 11:30 a.m., Ohio State administrators canceled all classes for the remainder of the day. Classes resumed on Tuesday. Public grade schools in the area went on lockdown before resuming classes as normal. 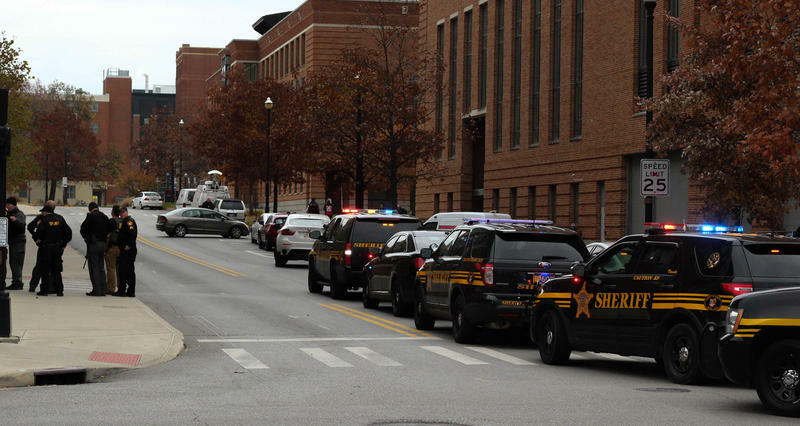 In a series of tweets beginning at 9:56 a.m., Ohio State Emergency Management and police warned people of an "active shooter on campus" at Watts Hall, at 19th Avenue and College Road. Police warned people to shelter in place. We lift up the victims and first responders of the tragedy this morning at Ohio State University in our thoughts and prayers. UPDATE 1/2 : Shelter in Place lifted. Scene is now secure. ALL classes are canceled on Columbus campus for the remainder of the day. 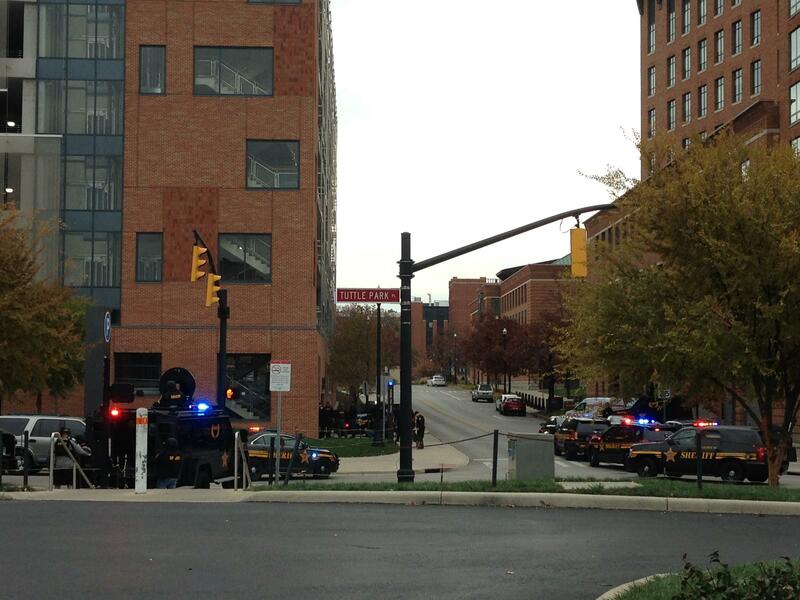 BREAKING: ATF Columbus Field Division agents are responding to scene of reported OSU active shooter. BREAKING: Fire department: 7 sent to hospital after active shooter reported at Ohio State, 2 stable, no details on other 5. This post will be updated with more information as it comes in. Last updated: Friday, December 2, 2016 at 12:09 PM. 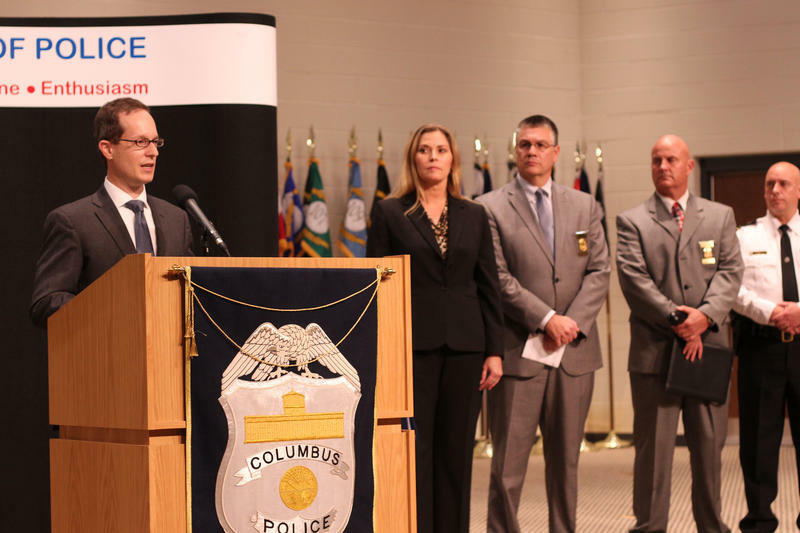 Columbus Police and the FBI say an ongoing investigation into Monday's attack at Ohio State still has hours unaccounted for in its timeline of events. 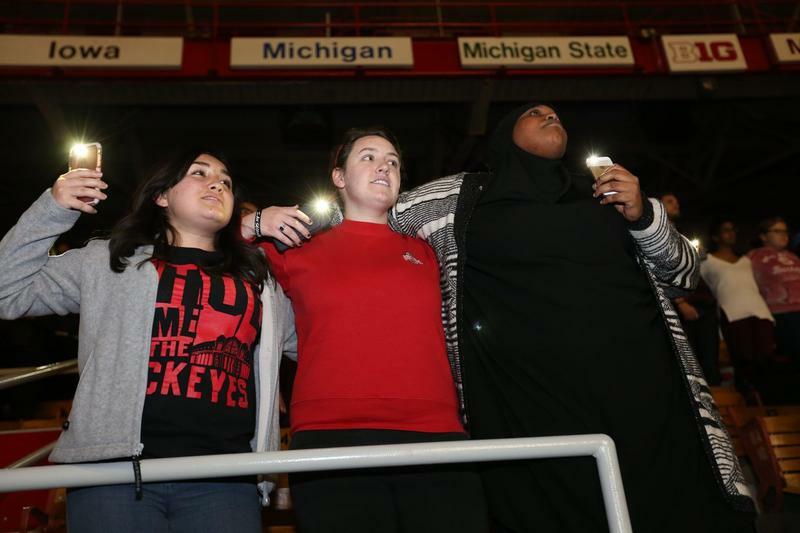 As Ohio State University recovers physically and emotionally from Monday's attacks, hundreds of people gathered at St. John Arena Tuesday night for a vigil that emphasized the campus's strength in unity. An Ohio State professor was one of 11 people injured yesterday at Ohio State University from an attacker who drove a car into a group of pedestrians and then stabbed people with a knife. 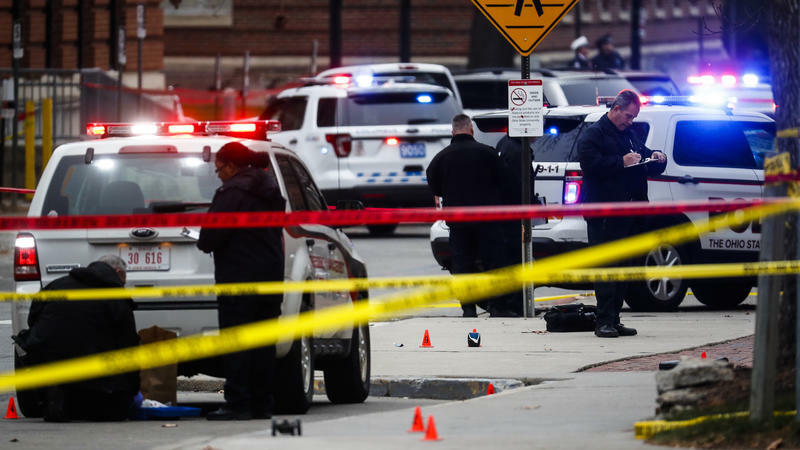 A man was shot and killed Monday after he struck a group of pedestrians with a car and then got out and cut people with a butcher knife on the Ohio State University campus in Columbus, Ohio, according to university officials. 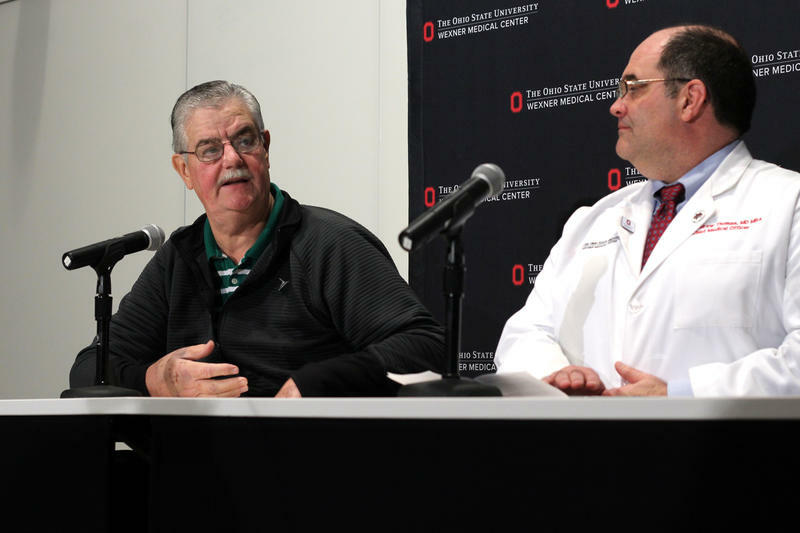 Eleven people were taken to three local hospitals, Andrew Thomas, the chief medical officer for OSU's Wexner Medical Center, said at a news conference. One of those injured was in critical condition. At an off-campus coffee shop Monday, Ohio State University senior Mohamed Farah catches up on his homework. "I didn't get a lot of work done today just because there's a lot going on," he says. "I tried to stay away from the news, but I kept going back to it." Farah first learned of an attack on campus when security sent a text to the entire university: "Active shooter on campus: Run Hide Fight." On Monday morning, the Ohio State University administration alerted students and employees to "Run, Hide, Fight," by text and email. A university student had plowed his car into a group of pedestrians on campus and then turned on others with a butcher knife. The incident lasted fewer than sixty seconds, and even after the attacker was shot and killed by a campus police officer, students and staff hid and waited for more than an hour. We discuss the attack, the police response, and the psychological toll of violence. 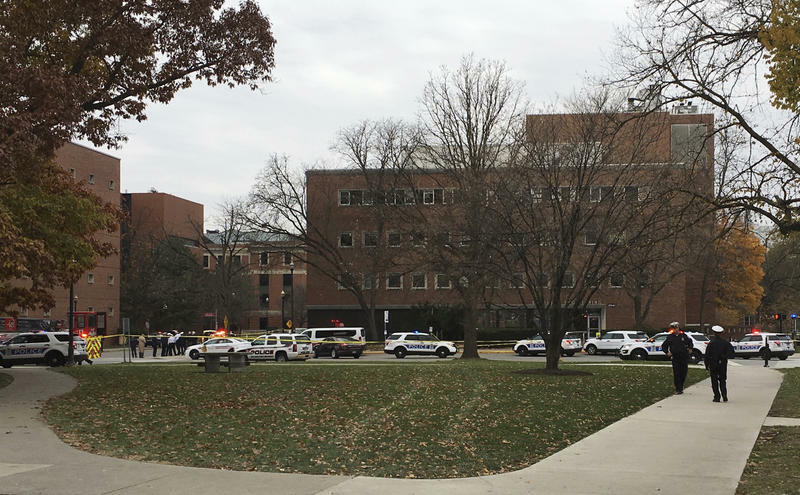 Tuesday afternoon ISIS claimed credit for the attack by 18-year-old Abdul Razak Ali Artan at Ohio State University. Today we will discuss the events that took place on campus, the methods used by ISIS, and the response of the Muslim community in central Ohio.